Board books are kinda becoming a thing around my house. My librarian heart is quite proud of the fact that Baby Bear is now totally fond of books. She loves to turn pages and point at pictures and don't even get her started on touch-and-feel books. So, when we checked out A B See (see below) from the library the other day (resulting in us both loving it), it got me thinking about the best of the best alphabet books we've read together. Some she loves more, some are more for me, but hey, that's what happens when you're a parent. Compromise. Sure, there's all kinds of "A is for apple" books: simple and to the point. But these are the ones that carry it a bit further, engaging the reader better. 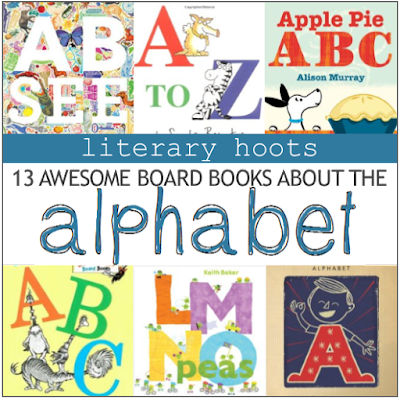 These are the "A is for awesome" board books that babies and toddlers (and parents) will enjoy. Yes, this one's text is one of the simple "A is for..." type of alphabet books. But it goes above and beyond with format and illustrations. It's got the answer hidden behind the cutouts of each letter, allowing for some guessing and fun interaction. I LOVE this one because it tells just about the cutest story there ever was about a little dog wanting a bite of pie. And it tells the story in ABCs! So, genius, because you get a good story and vocabulary practice all in one. So here's a seemingly simple "B is for Balloon" type of book, but hidden in the (gorgeous) illustrations, can you spot the butterfly? And the bumblebee? This is a great little discovery book, which makes the traditional alphabet book that much more fun. Okay, remember what I said about the last book? This one takes the discovery factor to a whole new level. "Alligator admires an apple" sure, but can you find the acorns? Australia? Armor? Acrobat? Yeah, there's a LOT. Like, I was poring over it, totally engrossed, discovering it all. And, with the illustrations being raised/embossed, my daughter was right there with me, feeling each image as I told her what they were. This book is SO genius. Well, this one just goes without saying. Except I will say it: the rhythm of the text, the creativity, and sentimentality. Brilliant. Love this one. Another classic, it's true. This story can get a little long, so I'd definitely recommend the song version—a fun way to learn letters. Speaking of Lois Ehlert, this is yet another classic. I'm personally a fan of her style of illustration, which is why I like it. Otherwise, it's a pretty basic way to introduce your child to all kinds of fun food, particularly veggies! If the veggies in the last book don't win your baby over, these adorable peas will. The wordplay in the title alone brings a smile to my face. It's a book full of awesome occupational vocabulary with soft colors and cute illustrations. Okay, okay, so this one may be more for the nerd in me...but you've got to educate your child about key comics vocabulary and character recognition at some point, right?? Okay, it's true, I just love anything by Sandra Boyton. The completely adorable animal illustrations? Plus great vocabulary? Yeah, it's a winner. This is another one that I just love because of fantastic illustrations. 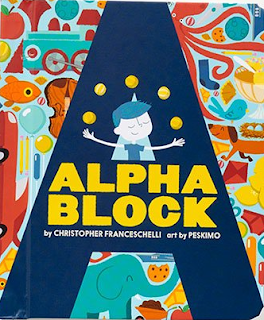 Yes, it's a simple "A is for..." book, but it's so retro and so clever. The letters are worked into the illustrations themselves! Genius. I particularly loved "L is for Librarian." Okay, yes, I'm completely recommending it based on the illustrations. And the theme. The baby appeal isn't quite there, but the mom appeal sure is! Be sure to also check out V is for Vittles, C is for Castle, M is for Monocle, and others that Paprocki has done. So cute!